Given this day in this corner of this galaxy, this certainly qualifies as a feat. 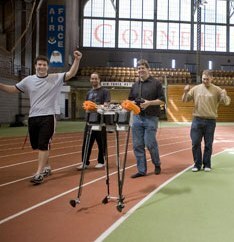 Cornell’s little Ranger ambled a record-setting 5.6 miles in an indoor track, untethered, using only internal power sources (batteries). It didn’t utilize nav sensors to get around the track, rather, Ranger was remote controlled. It’s previous record was set in 2006 where it walked just over 1/2 a mile, peanuts by comparison. In fact, extrapolated out, in less than a decade Ranger will be giving C3PO a run for his money.